From the back of the book: Nicole-Marie Handy has loved all things French since she was a child. After the death of her best friend, determined to get out of her rut, she goes to Paris, leaving behind a marriage proposal. While there, Nicole chances upon an old photo of her father—lovingly inscribed, in his hand, to a woman Nicole has never heard of. What starts as a vacation quickly becomes an unexpected adventure. Moving back and forth in time between the sparkling Paris of today and the jazz-fueled city filled with expatriates in the 1950s, PASSING LOVE is the story of two women dealing with lost love, secrets, and betrayal . . . and how the City of Light may hold all the answers. 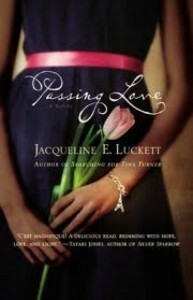 My thoughts: Passing Love by Jacqueline E. Luckett is a fantastic summer read. The novel weaves together a woman's past and present. Nicole, a divorcee who has always been safe, embarks on a journey across the Atlantic to Paris, a city she has always dreamed about. Armed with little more than a unexplainable connection to the city, a French dictionary, and a list of instructions (advice like take the wrong way home) from her deceased best friend Nicole stumbles upon a mystery that quickly upsets all she thought she knew, including who she is. With the help of new French friends, Nicole's story slowly unfolds. As a history lover, I really enjoyed reading about Paris in the 1950's and African American's place in it. During a time in the American South when they had to use separate entrances and drink from different water fountains, many African Americans found freedom and peace in the City of Lights. The jazz scene was in full swing and this book gives little snippets of what life then may have looked like. If you're looking for a quick summer read, look no further. Oooh this sounds good! It's officially on my to read list. Great review! Thanks, Mandy. I'm glad you enjoyed and I hope others will read Passing Love and discover Nicole's secret. PS. I love my Kitchen Aid mixer, too. !